It's listing there (and on Digikey) for $35 USD. 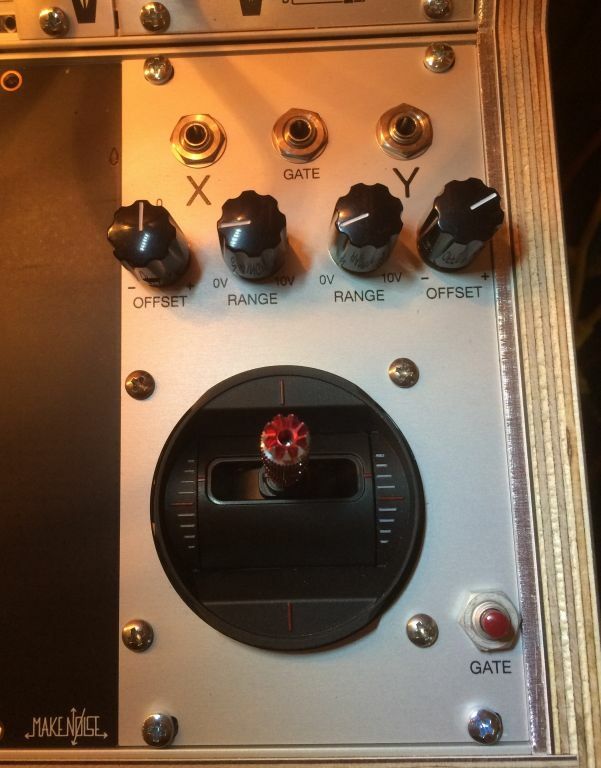 So I got one, and I have a circuit breadboarded for it, with the goal of getting it built into a Eurorack module. This joystick can be set to spring-return on both axes, but for the vertical axis, it has the option of disconnecting the spring, which is what I've done. So this joystick will have center-return on the horizontal axis, but will be free-floating on the vertical. Best of both worlds? There is a zero-trim control provided, for tweaking it to zero volts output at its center position. That one does come before the scaling, and would be set with a PCB trimpot. There is also a toggle switch for selecting unipolar vs bipolar cv. This switches the zero volts output position from the center of the joystick's throw to the bottom of the throw. I had originally wanted to provide for external input of signals, but this was complicated by the nature of the joystick's electronics. It has a 5k pot for each axis, HOWEVER, the full range of the pot is not used by the joystick (it ranges from about 1.9k to 3.1k). So you cannot drop an external (0-volt-referenced) signal to a 0 volt output. If there is panel room left for the 4 extra jacks, I might add in a pair of VCAs, which would have their control inputs wired to the joystick's CV. But it may just make more sense to leave this as a CV generating module, and leave the CV processing to an external VCA. interested in this. nice one. 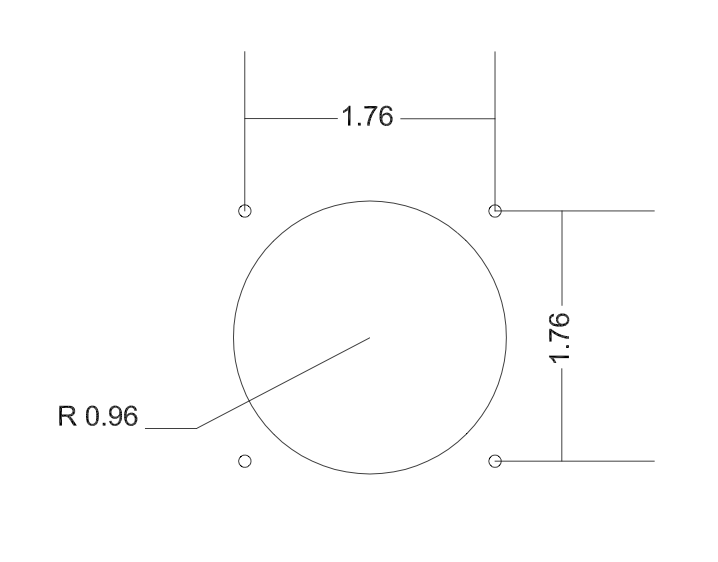 The Mouser datasheet doesn't give any dimensions, would this fit in a 1U tile? 1. I will definitely put that unipolar/bipolar toggle on the vertical (free-floating) axis. However, I am on the fence about including a unipolar mode for the horizontal axis, since that is the axis with the spring that automatically returns it to center. Since it's not a big deal to include it, and it keeps the layout symmetrical, maybe it's best to just include it. But I'm not sure if I'd ever use it. 2. Should the unipolar/bipolar toggle actually be a double-throw switch, that simultaneously halves the gain range of that first op-amp stage when in the unipolar position? Currently, the calculated gain of the first op-amp would already be well beyond the maximum output voltage of the chip itself, when the joystick was at its max position and the scale was maxed out as well (1.1 volts x ~18x gain = 19.8 volts, whereas the chip can only push about 10 volts max output on 12 volt rails). But the user could just reduce the scale control themselves in that case, to give the maximum usable range they desired. And I'm wondering if automatically changing the gain along with switching between uni/bi would throw the user off in their "feel" of the joystick behavior. That's a damn shame. 1U is where it's at for me going forward. Note that it uses 10k pots rather than the 5k ones shown in my circuit, and I also don't know if it uses the full range or not, so the circuit above would have to be modified to work with these. I think this is the appropriate response. I was going to mention those smaller joysticks as well. They come in all the controllers for little RC toys so I'm sure one could source them. A nice small 1u tile or something only a couple HP would be awesome. That "2-Axis Joystick" has a footprint of 1.40" L x 1.10" W. So at best, you're well beyond a couple HP. And don't forget space for a pair of output jacks, plus scale & offset knobs for each axis. But I'm not really interested in that option myself. I like a joystick that's big enough not to cramp up my hand while using it. And panel-mounting what was designed as a thumb-stick doesn't seem like the best ergronomic choice. Now, if I may gently attempt to redirect the thread - anyone have feedback on my questions about unipolar/bipolar modes, from a few posts back? I finally finished this module, and it works great. 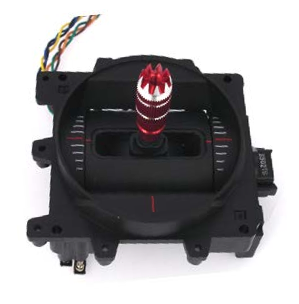 And that joystick part is back in stock now at Mouser. have you tried manually removing the horizontal springs? also wondering how much depth this has behind the panel? I did not try removing the horizontal springs - from what I remember, I think that could be done, but it seemed it could not be easily UNdone. Whereas the vertical springs were more accessible to try either mode... that's going off a rough memory though. Required depth isn't bad - about 1 1/4" for the most part. A small bit pokes out from the center, and moves around a bit as the joystick is pushed up or down. That bit probably extends the required depth to more like 1 1/2". If you're interested, I can post project files somewhere, including the Front Panel Express file (it was a squeeze of 1/10's of an inch getting the joystick and the red button to side by side in that space). Hi, did you make pcbs for this one? I didn't make PCBs for this, I wired it up on stripboard. I believe I used an Adafruit Perma-Proto 1/2 size board for this. It was a bit of a squeeze, but I worked everything in with a little planning. Ok, as I got two joysticks per panel I should make a large stripboard. Regarding the gate out you just plug the switch and a resistor between +12v and gnd? For the gate, essentially yes - I think I used a 5v source for the voltage however. Used a 1k resistor in series just for current limiting. Are you using this same model of joystick by Parallax that I did? Thanks a lot for the schematic. Those look like nice joysticks. Since they are 10k pots, with a full 0-10k range (unlike the Parallax, which was a 5k pot with only a partial range of movement), you will want to adjust R5 on my schematic accordingly. Do you know how to work that out? 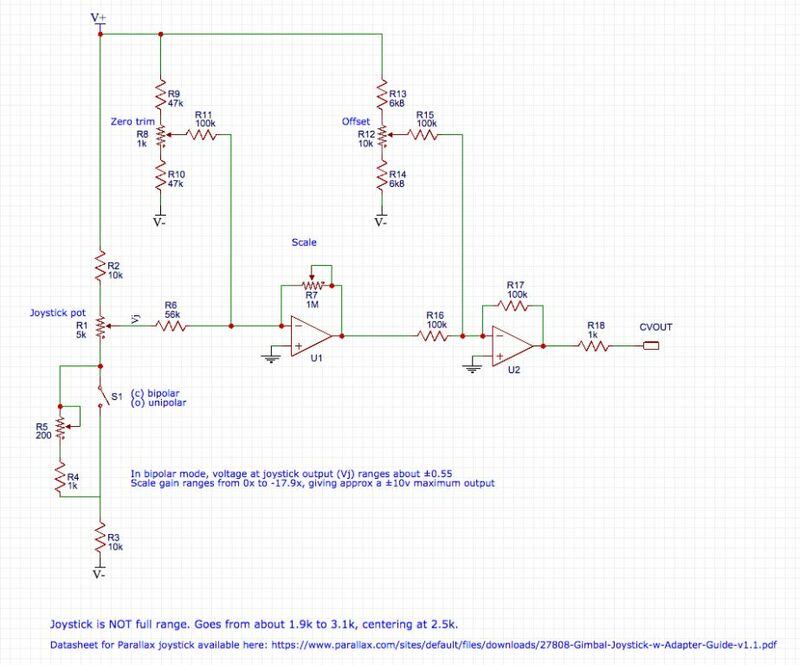 Attached is a PDF of the updated schematic, the one I actually built. The bipolar/unipolar switch is gone, and the zero trim and offset circuits are simplified (eliminating 4 resistors per half circuit). EDIT: re-uploaded the schematic to version 0.4, with cleaned up part numbers for the resistors. Note that this inadvertently changed the previously-referenced resistor from R6 to R5. So it's R5 on this new schematic that you'll need to adjust from 51k to something else, if you're using a different joystick. What op-amp did you use? I’d say it’s non-critical. I used a TL074 since I had a bunch around. Given the amount of slop in the mechanical aspect of moving a joystick’s potentiometers, there’s not much point in using a super low-offset opamp or anything like that.